Animals, animals. 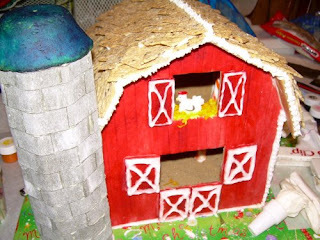 The book whose directions I was following only decorated the front of the barnyard animals, but I finally decided to decorate both sides so that the gingerbread barn will look good from any direction, including the back. It may not be obvious, but these animals are the same ones from yesterday, except that after they dried, I flipped them over and "painted" all over them a second time. 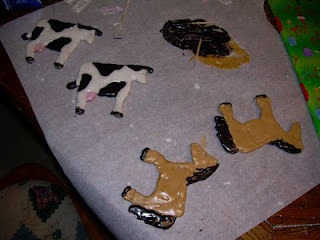 This time, the udders of the cows aren't quite so bright, but it's pretty much the same thing as before. I did the back side of the sheeps as well, although this time I didn't need to paint faces on them since the faces are on the other side. 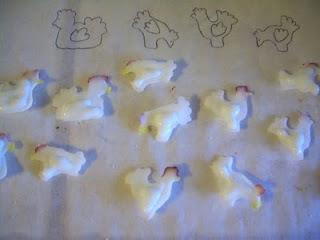 The chickens I didn't redo on the back, but I did add an additional layer of icing just to reinforce the pieces. Remarkably, not a single one broke on me while getting them off the parchment paper. Now it's time for a little landscaping. 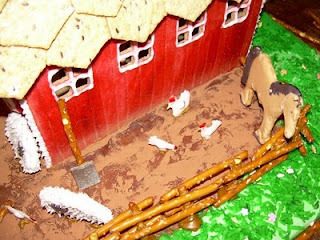 I mixed up some brown icing and laid it out more-or-less where I wanted to corral the animals. Time to grow some grass! 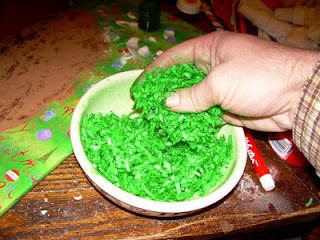 I took more coconut shavings and mixed it with green food coloring this time around. Presto! Grass! Time to build a fence to keep all of the animals from running away! First I set up the posts with pretzel sticks. Then follow with the beams across the posts. 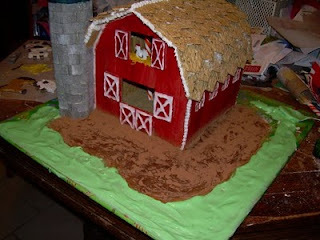 And the barn is FINISHED! looks awesome GT! I would love to start a project like this . . . Pretty darn cool. I love projects like that. Great to see it come together over a six part series. I suspect you'll have that for more than one Christmas if you can find a way to keep it safe in the off season. How cool... it looks great! Wonderful job GT!! Deliciously awesome! Needs some turtles. I liked the way you patiently put it together, paying attention to detail. Your commentary was fun to read, too. 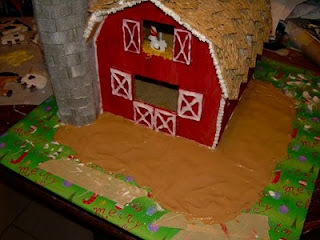 We all knew you were talented but the creativity you exhibited with this gingerbread barn is terrific! The coup de gras was the shovel! Quite ingenious! Who knew all the uses there were for Black Jack gum--besides the obvious, of course! Looks amazing now that it's done! I really love how you did the grass. 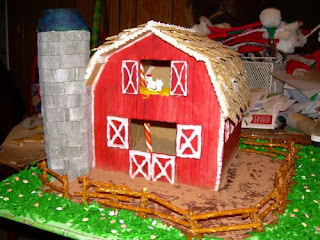 I have a question, though: What do you do with an elaborate gingerbread "house" after the holidays are done? Do you eat it? 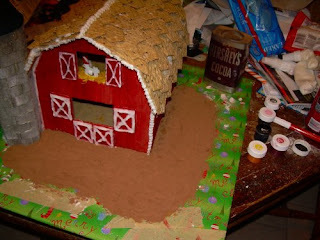 I've always found the building gingerbread isn't that tasty - it's stale, and the icing used to hold it together is always way too sweet and thick/hard to actually eat. 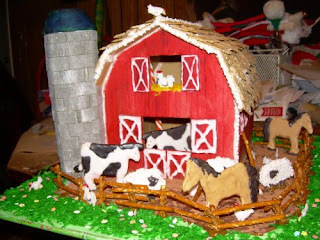 Eventually, I'll just be throwing the gingerbread house away. If someone really wants to try eating it, I won't stop them, but it probably won't taste very good. 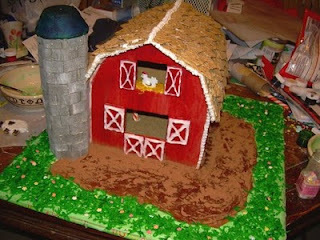 That's an excellent barn, GT! I love the little chickens!! I made a few little houses this year. I rarely get as detailed as you. After I get tired of looking at it, the house goes out into the back yard, where the squirrels, birds, and other critters devour it. It looks great, Ryan! 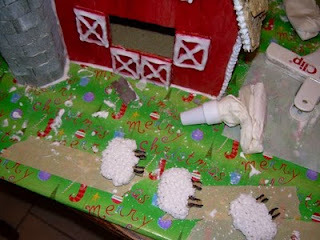 I especially like the sheep! Before you discard it - auction it off! throw it away?!? 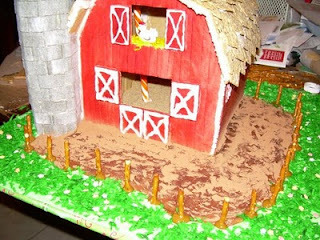 you've got to be kidding!....we just had an article in our local paper (The Everett Herald BTW) about elaborate gingerbread houses like the ones you make -- the lady in the article has been doing this for years.....they are donated to a charity and auctioned off. I bet yours would bring a pretty penny to some wonderful charity that benefits children. You can eat it...we eat ours every time. Break it up and put the pieces in a big jar or can. Cut an apple in quarters and lay it on a paper towel on top of the cookie pieces. Put it on top of the fridge and forget about it until spring (or at least a month). Find it, throw out the gnarly old apple, enjoy the delicious, soft, slightly fermented gingerbread. The Best! Just thinking, though, all that time could have been used carving pink rubber animals, barn, silo.. hey wait that sounds like a LB series, hmm? !